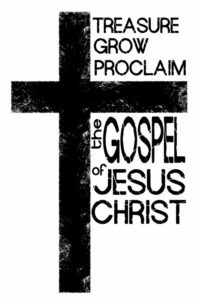 We exist to Treasure, Grow in, and Proclaim the Gospel of our Lord Jesus Christ. Treasure: This is the upward effect of the good news. We treasure God together, being rooted in His truth as we gather to sing His praise, sit under the preaching of His word, celebrate the sacraments, and encounter His empowering presence through prayer and ministry of the Spirit. Additionally, God is treasured as we daily remember the gospel, meet with Him through the Scriptures, and live in a manner that displays the unrivaled worth of the Savior. Grow: This is the inward effect of the good news. The church community is the context for spiritual growth and strength. Through active participation, we experience fellowship and care in authentic, godly relationships. As we serve together, we build and strengthen the church. Mature disciples of Jesus Christ help one another grow in grace, care for one another, and actively serve others together. Proclaim: This is the outward effect of the good news. Communion with God and with each other spurs mission. Evangelism is the joyful responsibility and privilege of every believer, and outreach is our others-loving response to God’s grace. Our outward ministry to the world includes a commitment to engaging culture by participating in “sending” ministry. The overflow of our love for Christ and love for the church is our love for the unbelieving people in our city. Our goal is to saturate the surrounding communities with the life transforming news of the gospel.